After 2 rain days, we were ready for more flying on Friday. 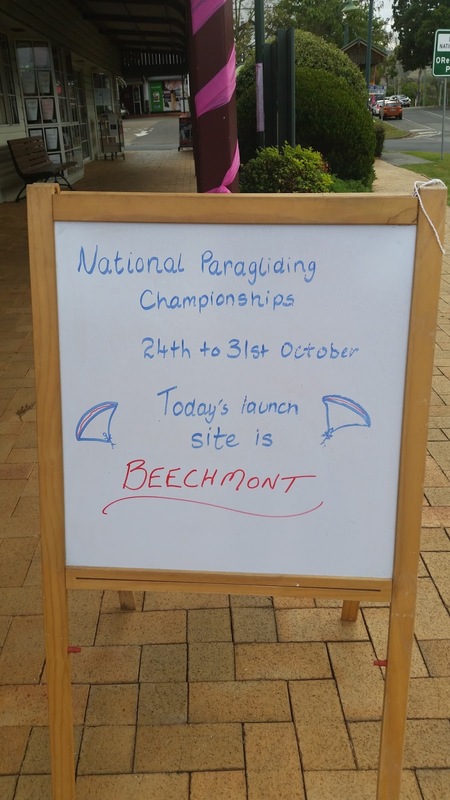 The call was made to go to Beechmont, but the usual rush to get wings out and ready was missing. 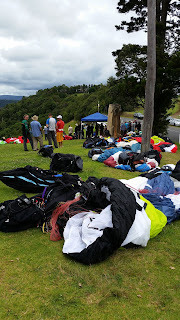 Might have been something to do with the full cloud cover, damp ground & limp windsock. The 54km task was set to 41 JOSE, with goal at MARG, and once the windsock started moving in the right direction, we were ready to go. There were several safety calls shared on the radio, due to congestion around launch. It's hard work keeping close to 90 pilots in the air along a small ridge when cloudbase is just a few hundred feet about launch. A few pilots got up and made their way to the edge of the start cylinder, but the task was thwarted by rain. A few splatters hit pilots flying near launch, then a few more. The task was stopped 10 minutes after Start - just in time for some & too late for others. The weather came in fast, with pretty steady rain hitting many pilots. I suppose it would have been good if your glider needed a clean. I heard it made interesting (and confusing) watching on the Live Tracking. In the end it was too short a day to call it a task. Things did get better though - in the evening, local hang glider pilots Rangi & Shirley hosted a Kiwi barbie, which was a great success.